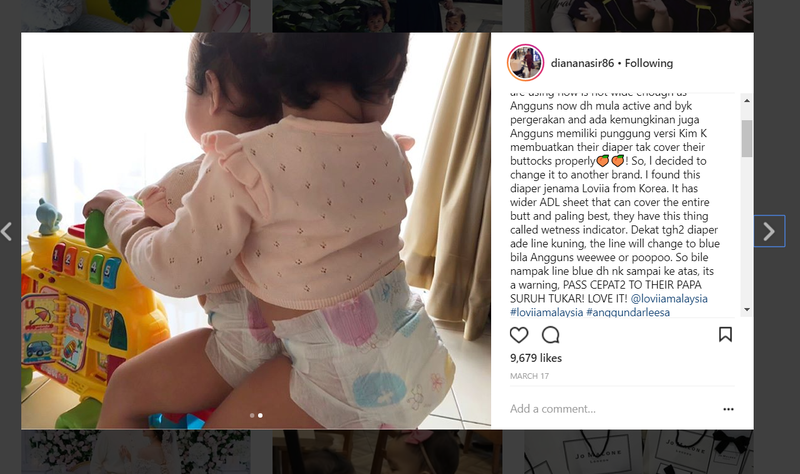 So, to parents that are working like us and been wondering how to keep your baby stay still kan, we have an answer for you (that we personally suggest). As our Yuka growing, we decided not to put her in that buaian. 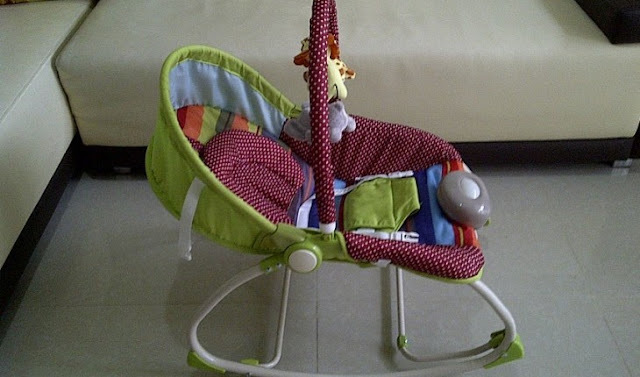 You know the one that keep on bouncing until your baby fast asleep (orang dulu dulu punya cara). Rather than that, we put her in a inflattable swimming pool. HAHAHA. 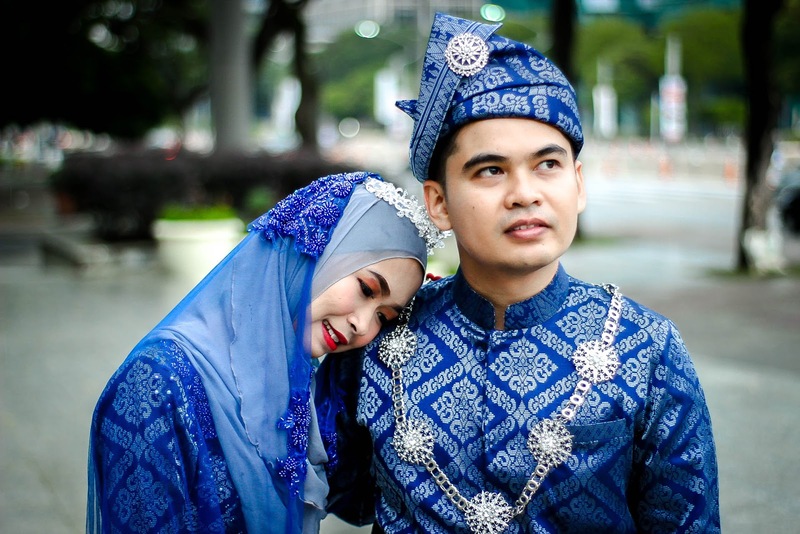 So, the traditional buai looks like below. 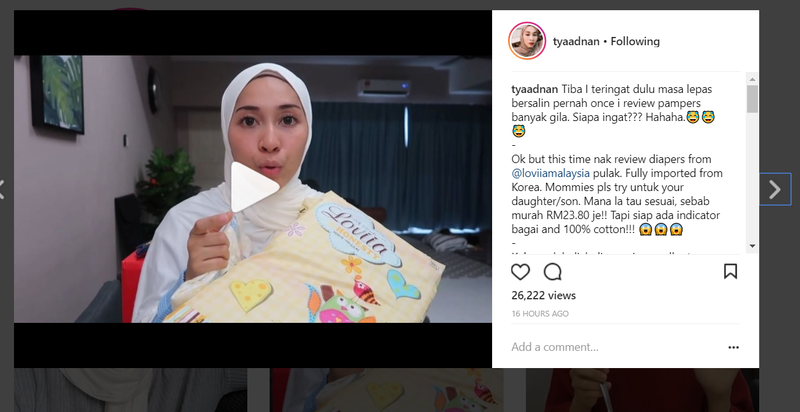 So, that parents won't be tired untuk buaikan anak dia. 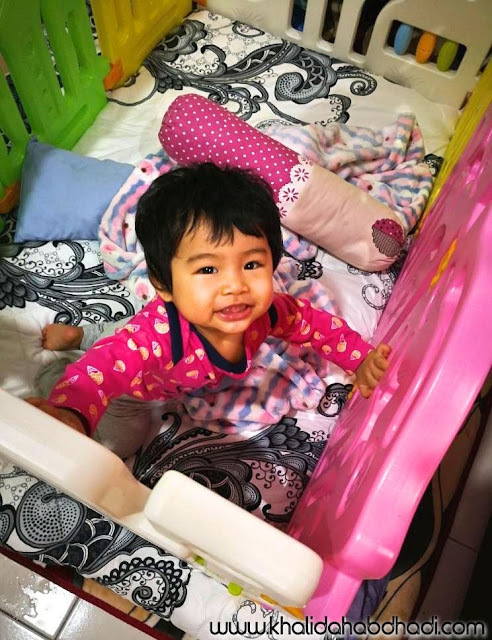 And as time goes by, makin banyak kes baby lemas tidur dalam buai sebab parents leka ingatkan anak tidur dalam buai tapi sebenarnya muka dah tertutup dengan bantal. 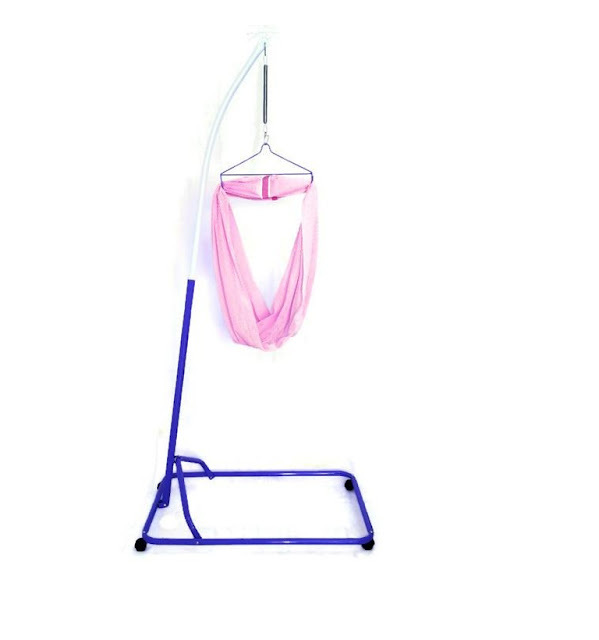 As for my reason not to have this is, I have seen before people who have kids using this; their babies just wouldn't want to sleep without their buai. Sampaikan ada parents yang travelling have to bring this along with them too! So, no no no. Memang ada terfikir nak beli ni dulu, but then I said that this wouldn't last long. I mean, baby will keep growing kan. So, this will be such a waste lah to use for a short time (dah lah mahal bende alah ni haha) So, 🗙 for this. But this doesn't really look nice lah kan dekat tengah tengah living area kita haha. Tadaaaa! 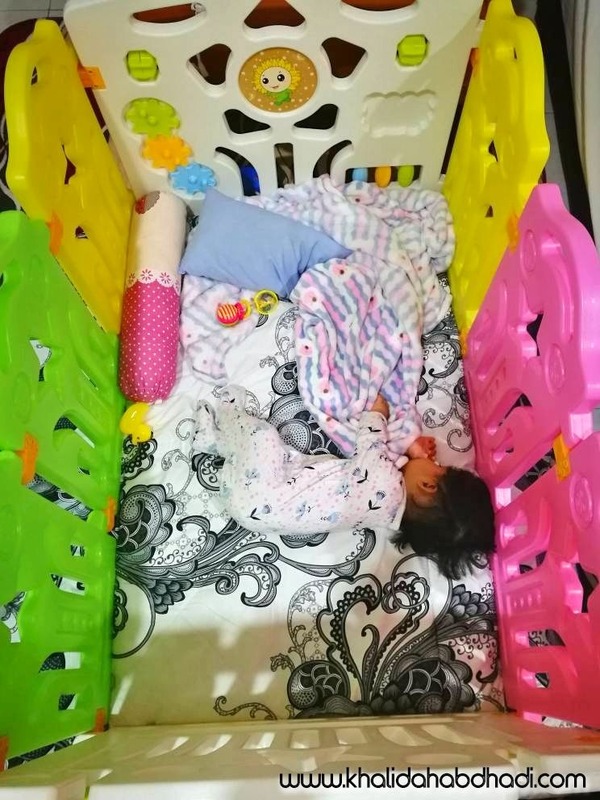 #babyYK own playing/sleeping area in her own playpen. 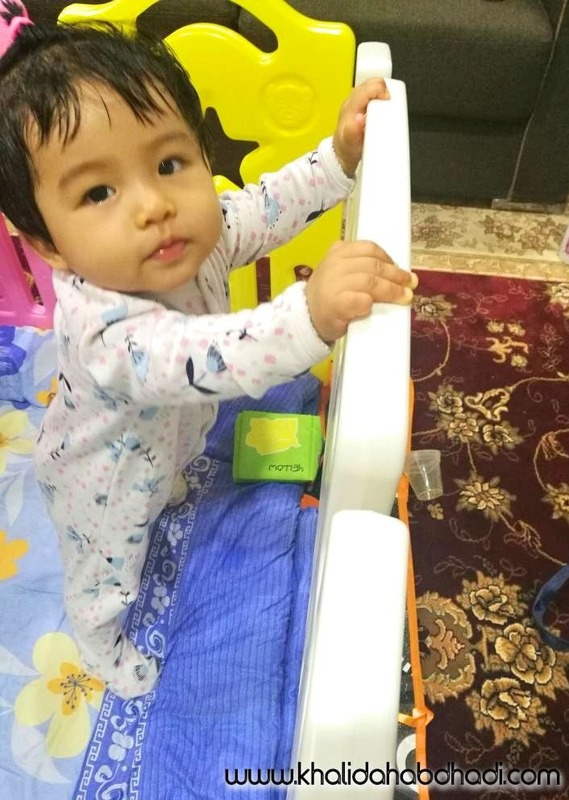 Tak pon lepas tengok ni, dia google harga playpen lepas tu fikir 1000 kali berbaloi ke tak kan beli nanti. Well, truthfully speaking. It's up to you guys how to educate your baby. We had our this way. As a first time parents, we always always discuss on things that we should and should not invest to for our baby. Invest as in worth to be paid in sense. FYI, We didn't straightaway bought this huge playpen. 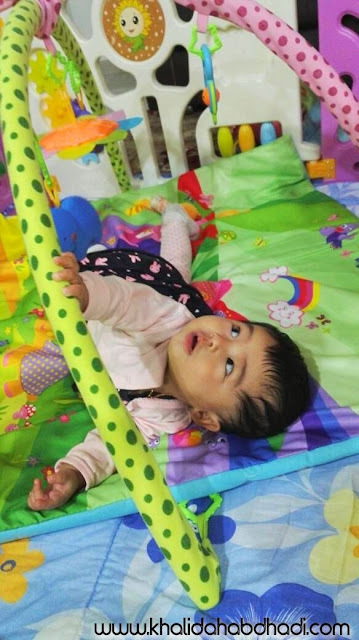 When our baby at her 2months, we wanted to help her crawl and explore more as she able to push her feet every time we lay her down in the picture position. So, after a discussion. We bought a playmats. (Yes, two playmat haha) One, was a rather small one for a travel pack. And another one as below. Husband told me, we need to invest wisely haha. Okaylah. Cukuplah playmat tu. 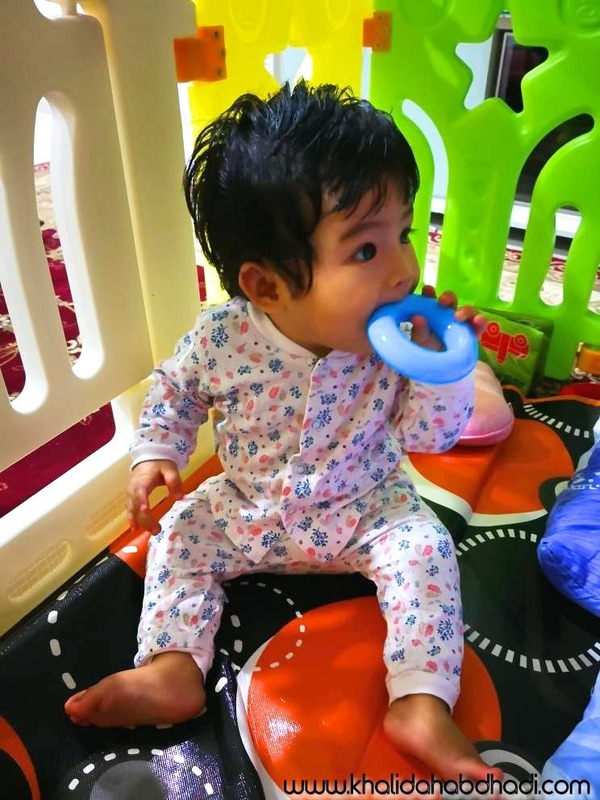 Ada benda gantung-gantung and teether to stimulater her sensory nerve and brain kan. So, I'm cool with that haha. 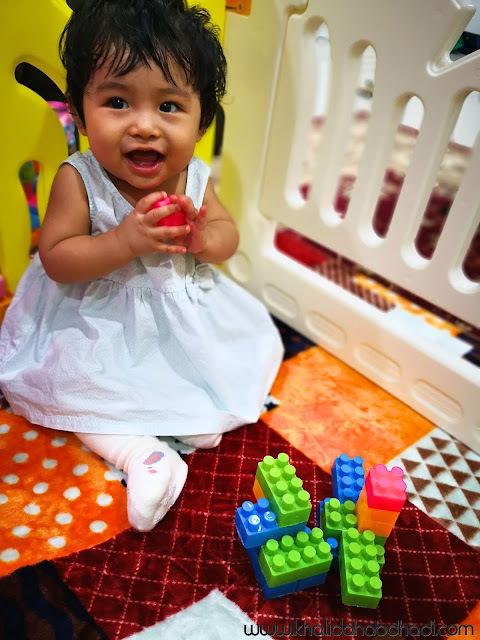 After watching her days inside her playpen I realised how this help us a lot. Because the playmat ada that gantung-gantung thingy. Hence, this help her to push herself to her own limit of growing you know. Because we want to ensure that all her nerves are working and help her discover this world. 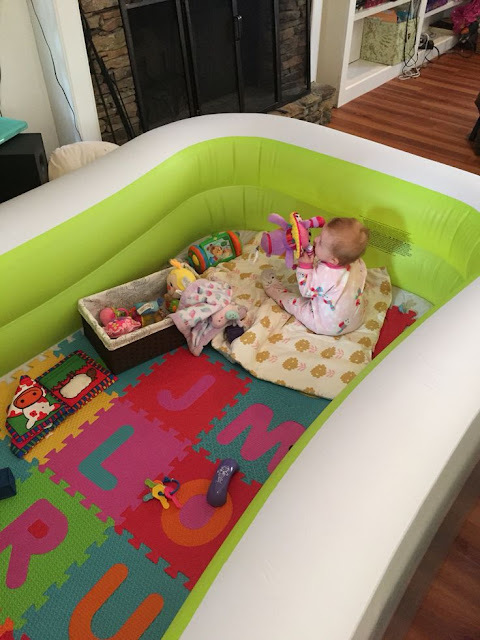 We bought the playpen when she was at her 3 months. The playmat was when she's at 2 months. To our surprise, she's growing up so fast (to me) because everyday I can see her progress in front of my eyes. We let her practice everyday. 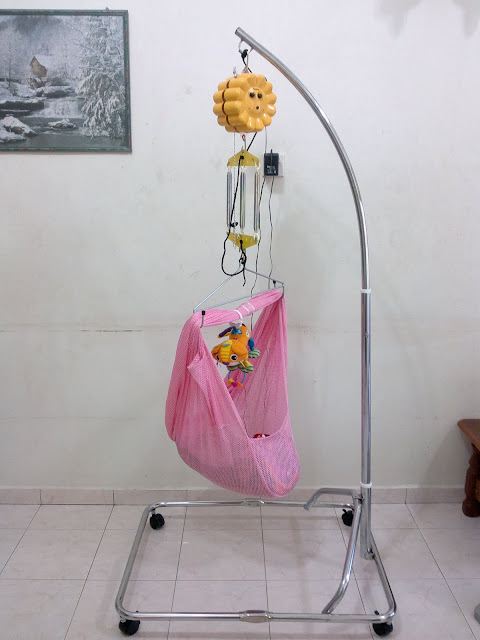 Sebab dengan colors ni dapat membantu sel-sel otak baby berkembang. She lifted her head that way since we taught her to do so from she was even 2 weeks. You see how her eyes that time. What I really like having this playpen is, I can just shorten my time and energy to keep my house or my baby play area. And if her cousins or anyone with kids come to our house. We do just offer them to play inside with our baby. 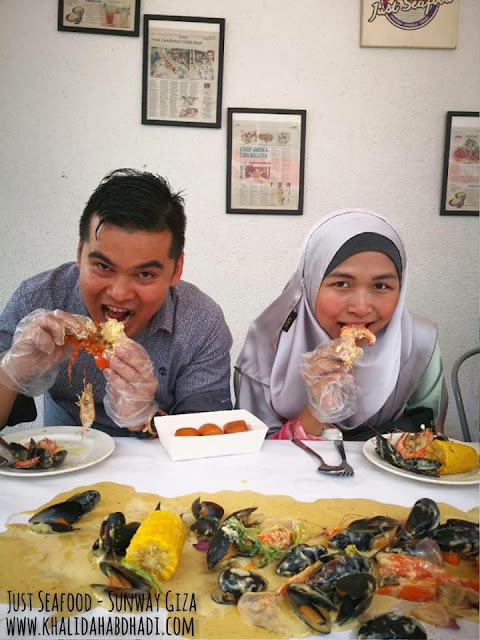 Ini pon penting tau, dapat ajar anak kita kenal orang and jadi peramah. From crawling, she begun to figure out herself how to sit. Slowly, she push herself to her limit as she know that she is in her own comfort zone. This time, she was trying to had her very first sit! Luckily I managed to capture this! not just sucking their thumb or what not. This moment is important. If you miss this moment, you might will regret it in future. Little did we know, she didn't take long time to learn how to stand up on her own! 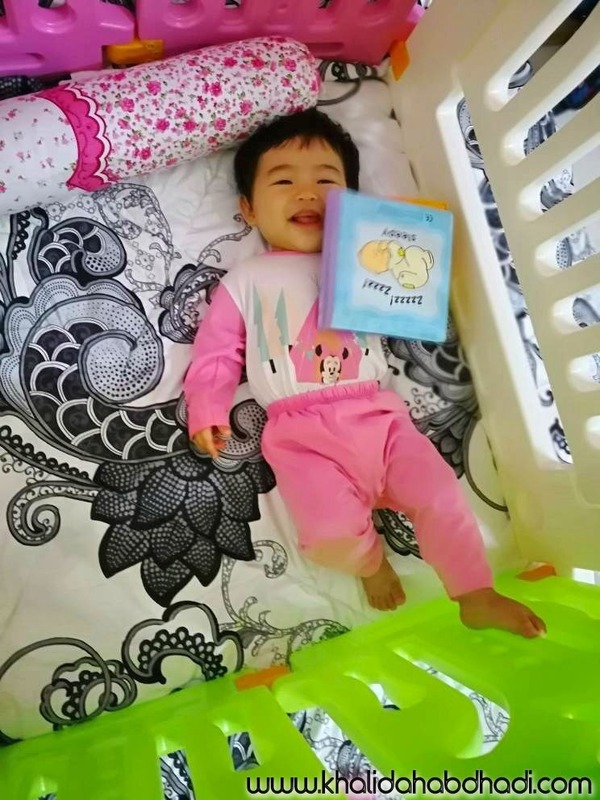 With the help from playpen, she practice her skills everyday! We witnessed ourself how proud our baby look like as soon as she realised that she able to stand up on her own! Don't worry about your baby falling down, as that's how they learn. Most people asked, how we put her to bed. After breastfeeding her. I will casually. Anyway, after a month my husband bought this for our living room. We decided to have another set in our bedroom as her sleeping area (picture above was taken in our bedroom). Tak de lah membazir beli small bed and as she grows kena tukar katil lagi 😂 Ini kalau agak agak sempit je (meaning she's growing taller. We just need to buy the pagar (panel) one or two more and sambung je. 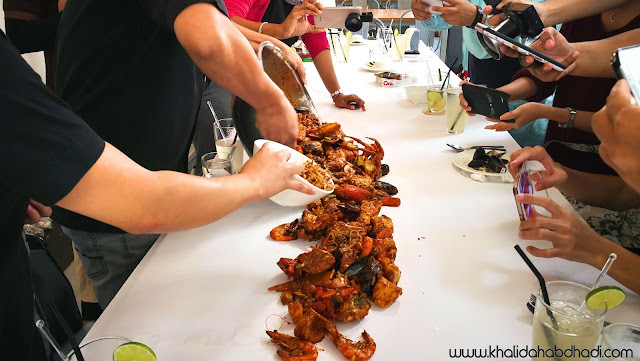 1 normally will cost Rm40+ . So, jimat lah kan. Haha. So, if you come to our house. You will see her play area first. Haha. Betul betul depan tv. If she's bored, she'll just watch tv silently. If not, she'll play all her toys we bought her. 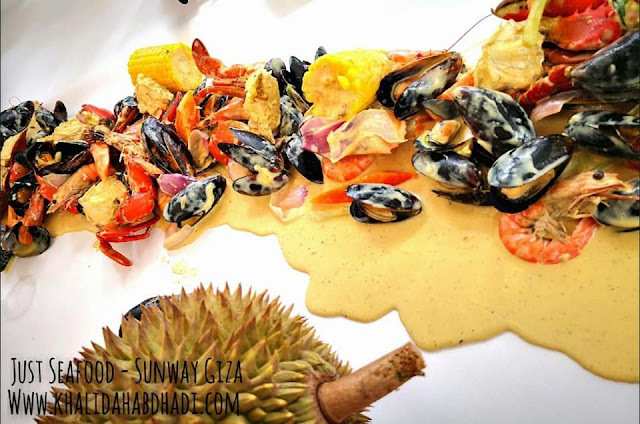 WOULD YOU IMAGINE HAVING SEAFOOD & DURIAN TOGETHER? 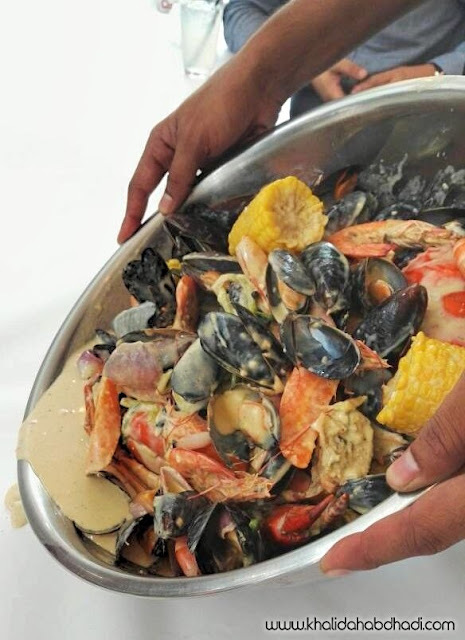 - Just Seafood Surprises you! 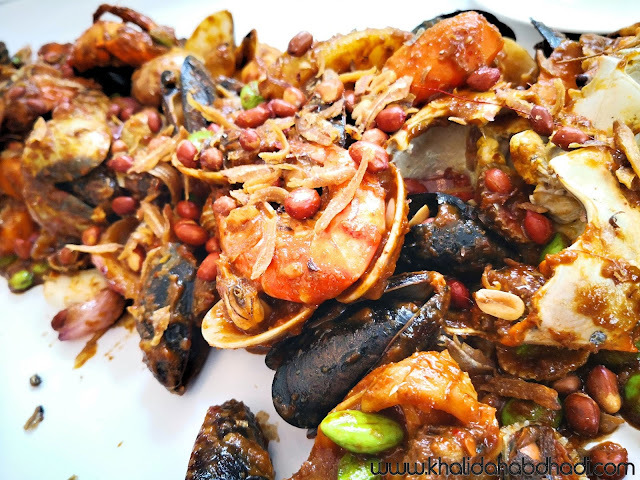 This post has been the most awaited post to my readers since I shared pictures of mine having such fine seafood last two weeks (I think). 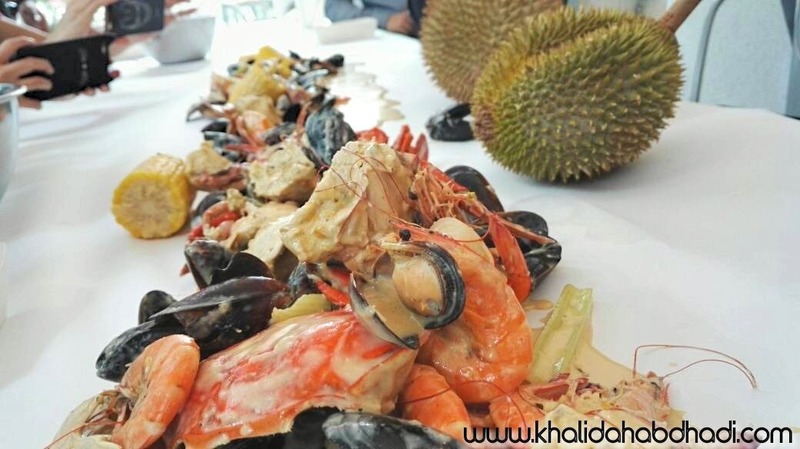 Truthfully speaking, we have heard this such menu wave since end of last year if I'm not mistaken. 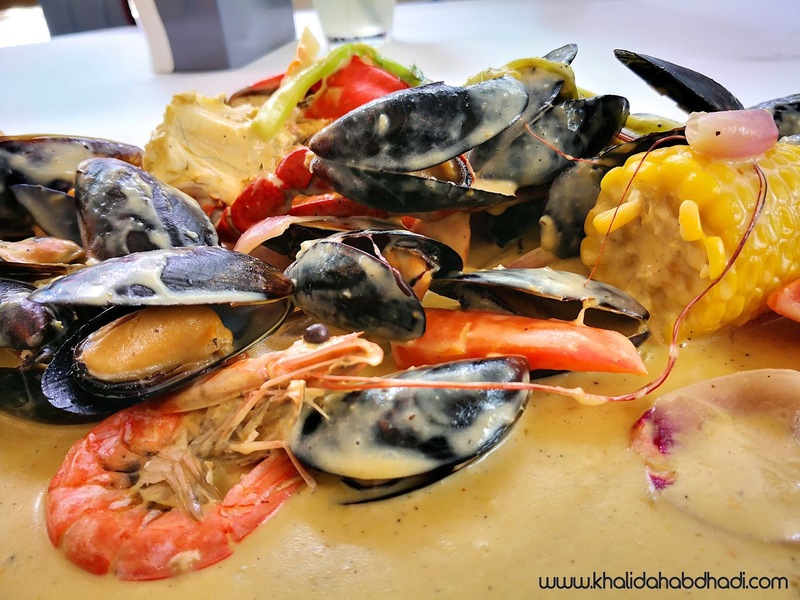 Not long after that, many people claimed to have their own style of 'seafood lambak'. 'Lambak' literally means to be served as it is on the table with endless portion in Malay. So, me and my husband along with other blogger friends tried the well known seafood restaurant that serves imported fresh seafood all the way from several countries just to satisfy our(you too I meant) craving! 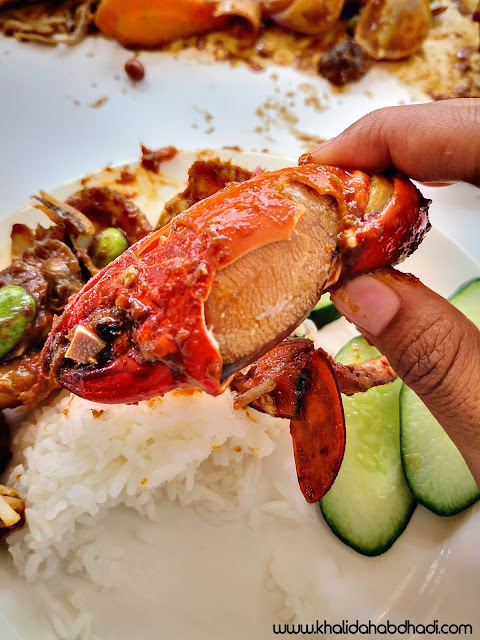 Perfectly blend cajun sauce that covered every inch and piece of seafood served, Nasi Lemak Cajun Seafood never drop their spot in their Most Demand or Best Seller dish from Just Seafood. Some might fancy to have their Nasi Lemak in traditional way with a touch from 'Petai' . We know you never had one before while eating this kind of food together with, so Just Seafood have them for you! You may add 'Petai' on your order too (just because we want it so bad with that perfect cajun sauce and those fleshy meaty crabs and siham). 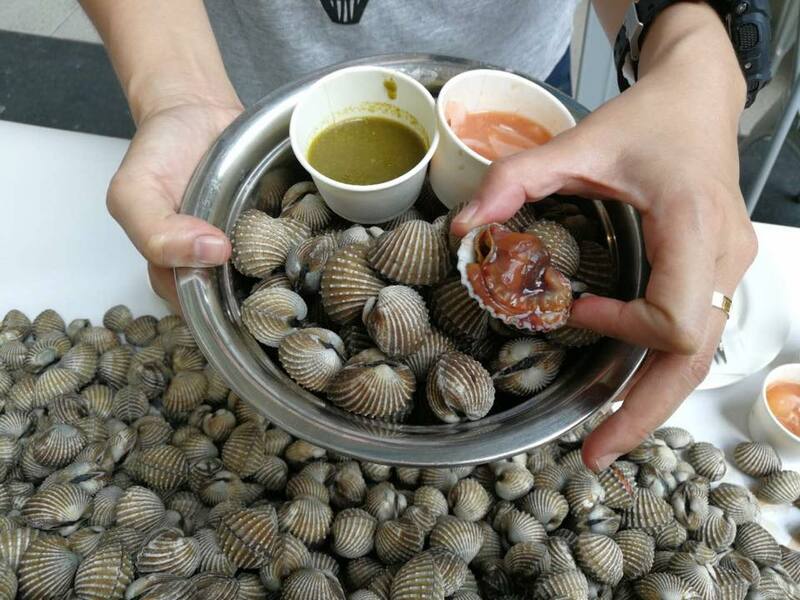 Famous with their cockles/siham for a cool night out, you bet how big and fleshy their siham are! No wonder. this place is famous at night too! Now, they have came out with the new wave too. 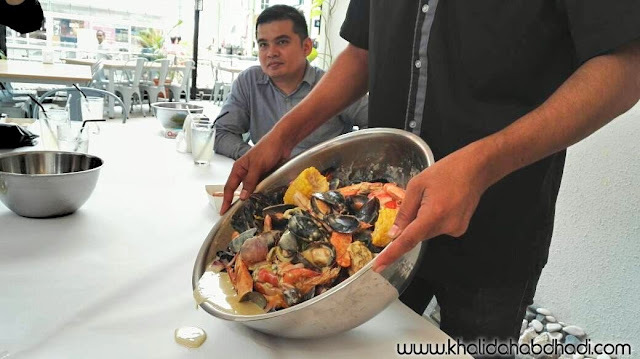 And this time will trigger Malaysians taste bud I promise you haha. 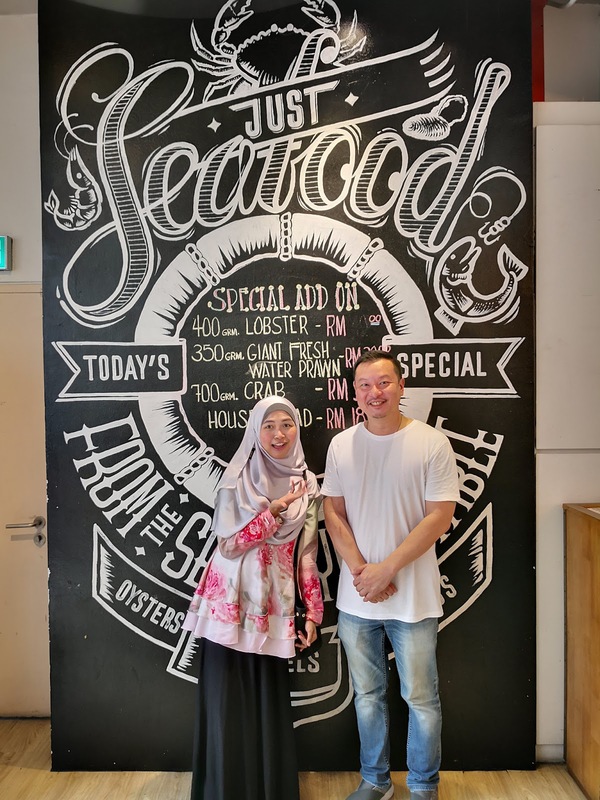 for coming out with the very 1st Malaysian Seafood Durian based! 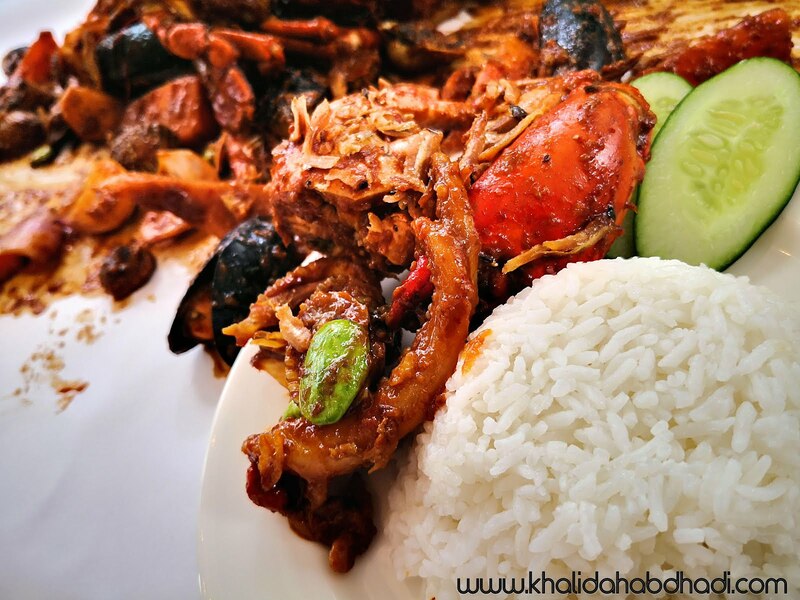 Give your partner a new dish this weekend or hang out some time with your family here and every penny is worth to be spend here! To parents who love on finding good quality products with very very affordable price for their little ones, this is the right page you are viewing I'm telling you. 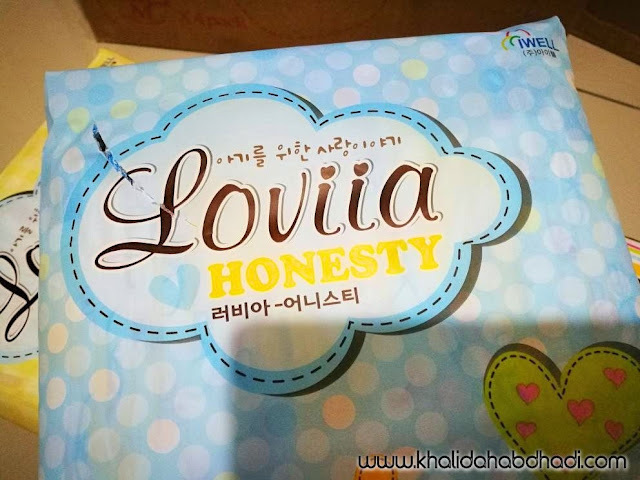 I managed to come across to this one good baby products all the way from Korea, that is Baby Diapers namely called Loviia Honesty or Loviia Diapers. Despite it's cheap price (affordable price) , the quality is a top notch for me. Let us go through one by one. From it's packaging to the quality. As I grow, the only packaging of baby diapers I ever knew for my lifetime is that they are packed in a wide packaging. That sometimes I feel it is a bit hassle for me to bring it everywhere. Dragging the diapers bag is a hassle and to keep them too need big space/storage. While Loviia Diapers, is totally the other way round. 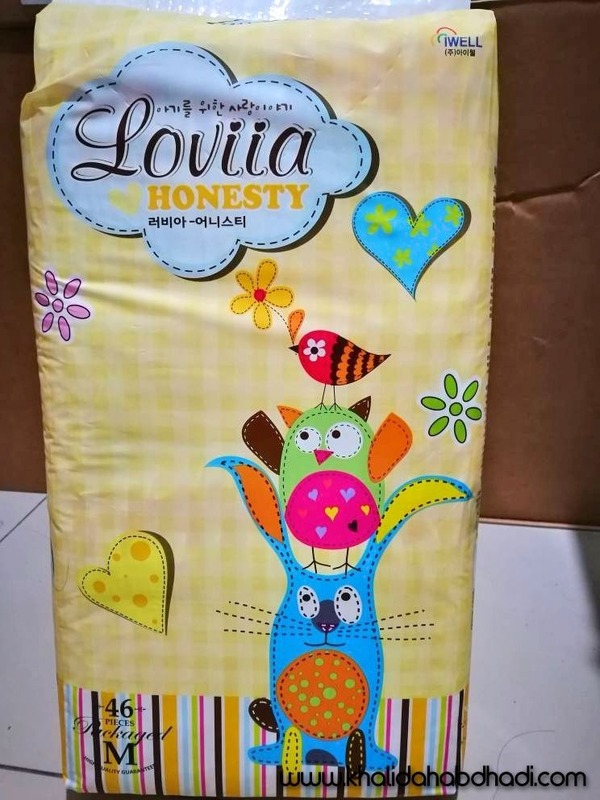 The width is not that big and doesn't seem to take so much space than regular/common diapers that we found in the market. 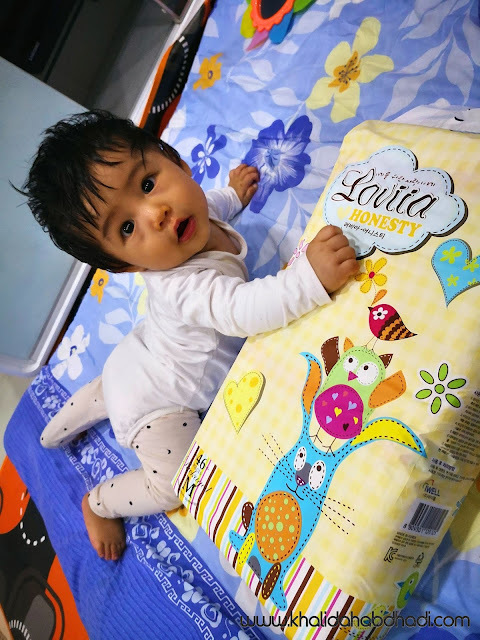 Surprisingly, they are contrary is taller than other diapers packaging. Which is GREAT! I really really am personally giving 🌟🌟🌟🌟🌟 for its cute and attractive design. Like, who didn't like cute things right? And the seller too mentioned to me that every sizes they have different designs! Another great idea on how you can teach your babies differentiating which one is theirs and which is not. 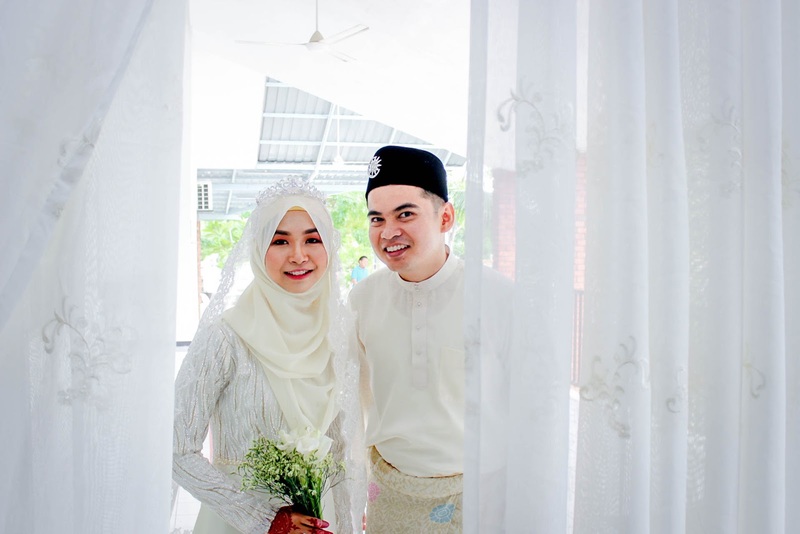 Comel kan designs dia semua? Okay. First thing first, I must admit even before I have my baby, I like to see baby diapers with Wetness Indicator. I have no idea why, but really I like to see that haha. Maybe as I know that this will help me in future. Wait, Yes, I heard you asked what is Wetness Indicator. A wetness indicator is a common feature in many disposable diapers and toilet training pants. It is a feature that reacts to exposure of liquid as a way to discourage the wearer to urinate in the training pants, or as an indicator for parents that a diaper needs changing. So, how kan the wetness indicator look and works? You see, there are 3 yellow lines on the diaper. This will eventually turns to green-blue when your baby diaper is full! See, the yellow now turns to blue. This was after 4-5 hours Maysaa Yuka wearing it. This is another most frequently asked questions from us, the mothers to the sellers. YESSSS! I get a YES answers from them! How can I am not grateful to know about this? It is true and I have tested with my baby, #babyYK. 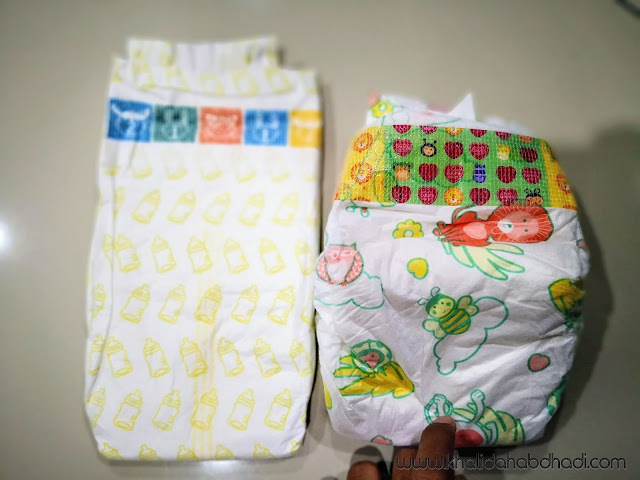 Left : Loviia Diapers M.
Right : Tesco Love M.
This is normally a major problem for mommies like me who send their babies to nursery or daycare. We tend to stack our baby diapers for their usage everyday right? But with normal diapers that we used, we barely can stack up numbers of diapers inside the bag. As you know, they are thicker and bulky. Sometimes we can only put up to 6 diapers in a tower. Inside my diaper changing bag. But again, surprisingly with Loviia Diapers, I can stack the diapers 2X MORE! Because they are so thin, not bulky and lightweight! Do you have the same problem with me on every time ruining and tearing apart your cute baby diapers bag? 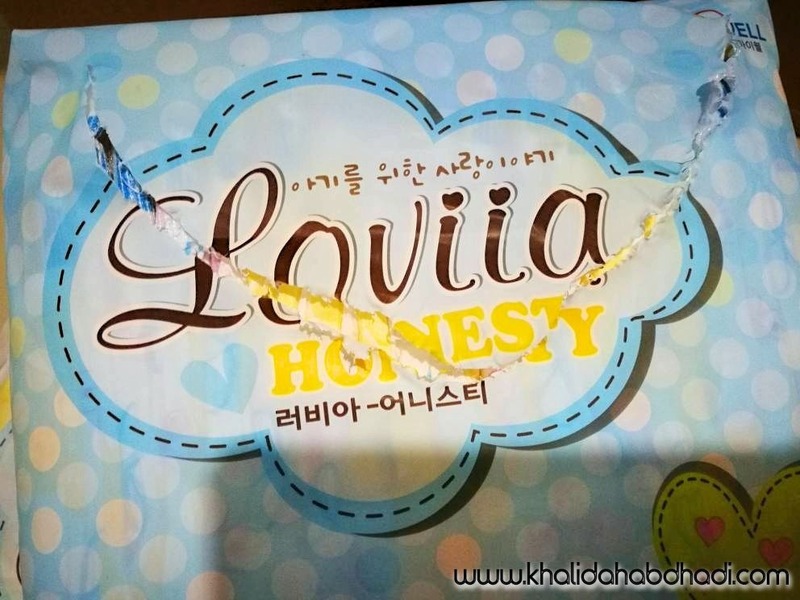 With Loviia Honesty, I bet everything is honest! They have the ready-to-open/tear-me-up-here that specially design to not ruining your baby's cute Loviia Diapers bag anymore ya! If you zoom in, then you will see lines to be teared up. I have no idea how but Loviia Honesty is not only a diapers that you would just want to buy and throw away if not using it. This diapers have so many good things packed in a bag!